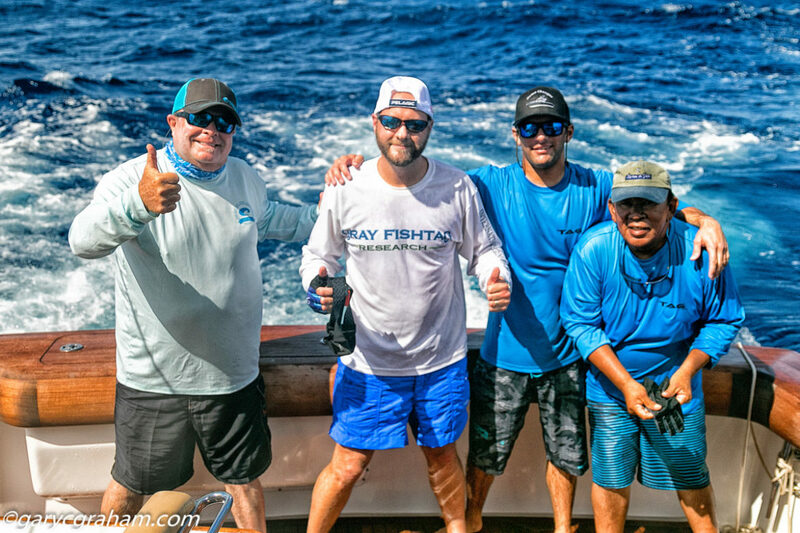 The Striped Marlin “Tracy” was caught by angler Dave Bulthuis of Costa Sunglasses, and tagged with a satellite tag (PSAT) on Nov. 1st, 2016. The PSAT stayed on the fish and collected data for 38 days. At its closest point, the fish was 9.05 km (5.6 mi) from the beaches of Los Cabo. The Striped Marlin in total traveled an approximate distance of 1488 km (924 mi) in a southeast direction. 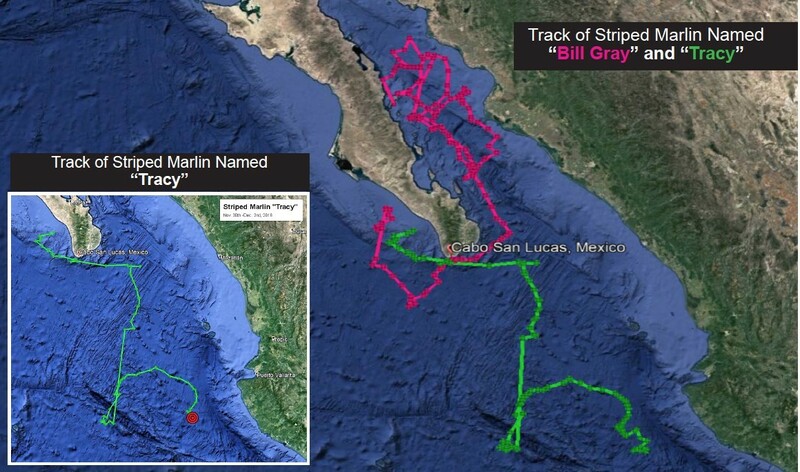 During that time period, the fish traveled over the Mazatlán Basin and went on to spend 10 days around the Rivera Fracture Zone. The Striped Marlin exhibited a large vertical movement pattern which varied depending on daylight or darkness. 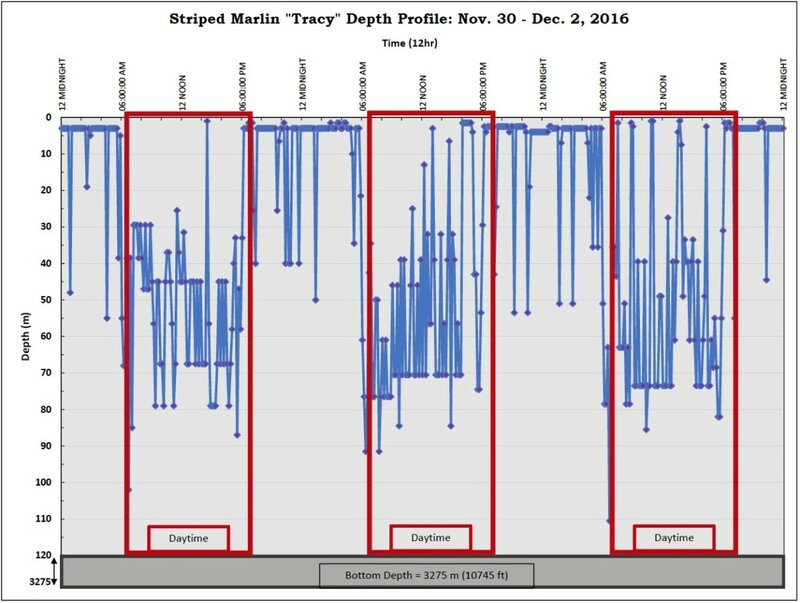 At nighttime, the average depth was surface to 3 m with occasional dives to 50 m.
During the daytime, the fish had extensive vertical movements with an average depth of 55 m, and rapid dives to 70 m followed by rapid ascents to 30 m.
Both Striped Marlin “Bill Gray” and “Tracy” were tagged on the same day; however; one fish went north to the Sea of Cortez and the other fish went south. They both also demonstrated a vertical movement pattern similar in profile to swordfish, with nighttime hours spent at the surface and daytime hours spent at depths 40-80 m.